I'm cleaning out my stash and have so stamps that need to be re-homed so they don't live a neglected life. Shipping is $3 for the first stamp and $1 for each additional when shipped in the US. 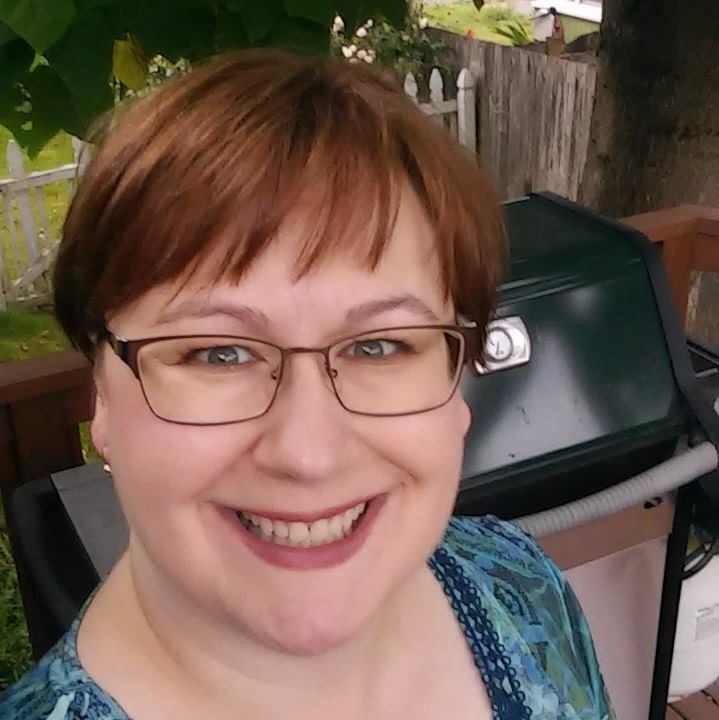 Purchase 5 or more stamps and I'll provide a shipping quote. My stamps are very reasonably priced. I would rather charge a bit extra on shipping the first one than to raise the price on every stamp $1. I'll try to post photos on my FB page later but it's very easy to Google the set by searching for the item number + CTMH. Payment via PayPal. Please leave a comment below with the stamps your interested in, your zipcode and your email address (I will NOT publish your comment). I will send you a PayPal invoice. Pending cc1025 You Are My Happy This is the only the alphabet set. This list was partially updated 2/21/2017 by deleting the majority of the items that have been sold. This weekend I noticed a LOT of my CTMH friends were using glitter paper. I think we all needed a little extra sparkle. I created this banner with a LOT of sparkle! I love our new 3 packs of Glitter Paper that have all 1 color. I'm using the super shimmery red and the icy white for this project. And a little leftover Snowhaven that's been retired for a couple years. I had been wondering how I could use up this paper with the bold Nordic striped pattern on the other side. Now I know! 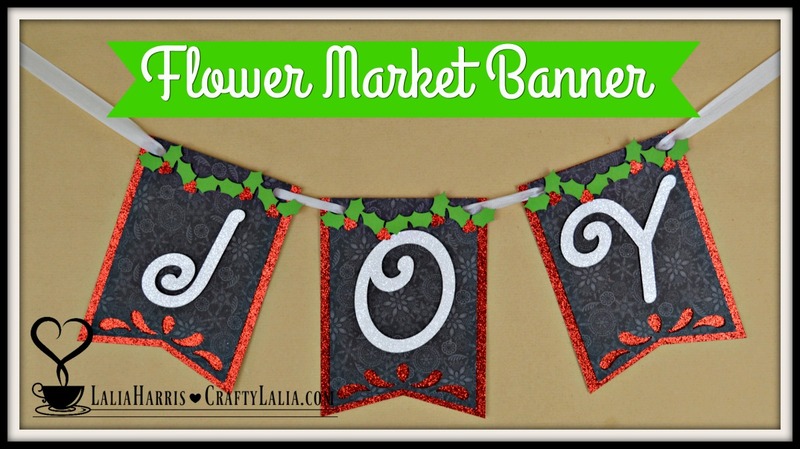 Every bit of this banner was created with the newest CTMH Cricut Cartridge Flower Market. This is the SURPRISE banner on page 5. In Design Space I used the contour button and hid the design at the bottom red banner pieces. I have lots of layers here. 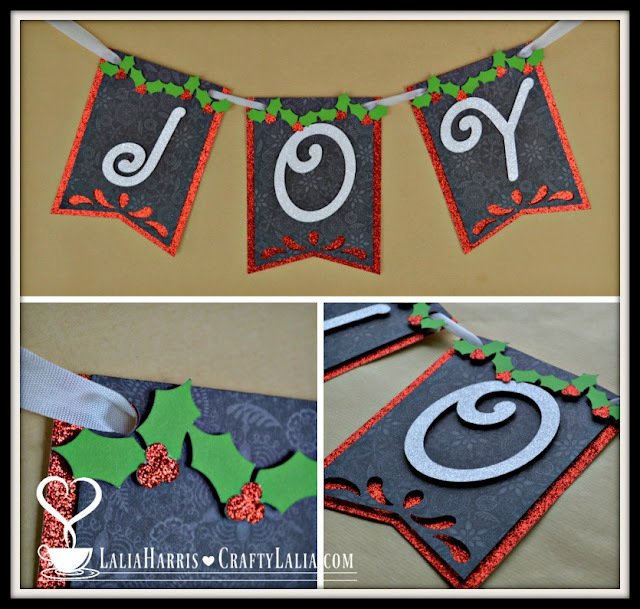 The only thing that I adhered with Bonding Memories are the holly berries to the Willow colored holly border. Everything else is attached with the original 3D Foam tape for maximum lift. Right now I have it attached to a closet door. Here's a pic to give you an estimate of size. Each piece is 5.5" tall and 4.15" wide. I used just over a yard of ribbon. I also have a LARGE version where each piece is 11.5" tall and about 8.5" wide. Did I mention how I love that each pack of glitter paper now has 3 sheets of the same color? It makes projects like this one so easy. 1. Order a pre-cut version below for $7. Need it shipped for $2? No problem. 3. Join my team and receive all of my files to use for free! Orders placed by November 20th will ship by December 2nd. It may take about 2 weeks to order and create kits. Kindly email me if you have questions about how long your order will take before you order it. Unless I have supplies on hand, I will not be able fill orders placed after December 10th.